Most Americans know about the "Hare Krishnas" only from encounters in airports or from tales of their activities in the East Village and Haight-Ashbury in the 1960s. This entertaining and sensitive book deepens our knowledge by tracing the paths of those Western Hare Krishnas who eventually traveled to or lived in India. The charismatic leader of the sect, the Indian monk Swami Bhaktivedanta, aimed to save Westerners from what he saw as materialism and atheism by converting them to worship of the Hindu god Krishna. In addition, he hoped that Western disciples would inspire Indians to rediscover their own religious heritage. Charles Brooks describes in full detail the work of the "reverse missionaries" in the town of Vrindaban--which, since it is traditionally considered to be identical with Krishnas spiritual world, is one of the holiest places in India and the site of some of its most engaging rituals.Have the Western Hare Krishnas really become part of Indian culture? Can it be that Indians accept these foreigners as essentially Hindu and even Brahman? Brooks answers in a way that radically challenges our accepted images of Indian social dynamics. 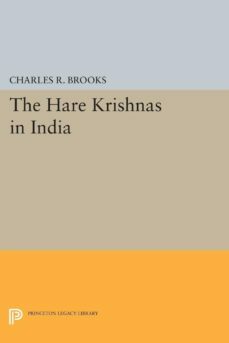 Analyzing the remarkable success of the International Society for Krishna Consciousness and their temple complex in Vrindaban (where Bhaktivedanta was buried in 1977), Brooks describes the intricate social, economic, and religious relationships between Westerners and Indians. He demonstrates that social rank in the town is based not only on caste but also on religious competence: many Indians of Vrindaban believe, in Bhaktivedantas words, that "Krishna is for all. "Originally published in 1989.The Princeton Legacy Library uses the latest print-on-demand technology to again make available previously out-of-print books from the distinguished backlist of Princeton University Press. These paperback editions preserve the original texts of these important books while presenting them in durable paperback editions. The goal of the Princeton Legacy Library is to vastly increase access to the rich scholarly heritage found in the thousands of books published by Princeton University Press since its founding in 1905.